SCVHistory.com | Tesoro del Valle: Homes Planned for Hog-Farm Site, 1992. Homes Planned for Hog-farm Site. Firm studying ways to overcome environmental impacts in San Francisquito Canyon. By Sharon D. Smith | Los Angeles Daily News | October 5, 1992. SAUGUS — Heirs to the company that produces Farmer John meats plan a 3,000-home development on their defunct San Francisquito Canyon hog farm, and have begun studies to determine how to overcome environmental and traffic concerns, officials said. Tim Collins, development consultant for the Los Angeles-based J-BLAK Partnership, said the plan is to build 3,000 single-family attached and detached homes on about 1,000 acres and designate up to 500 acres as natural open space. Part of the property is on land designated by U.S. Fish and Wildlife Department officials as a significant ecological area because it is one of the few habitats of the endangered unarmored three-spined stickleback fish, Collins said. "That is a sensitive area, in part because the San Francisquito Creek runs through there," said Frank Meneses, impact analysis supervisor with county regional planning. The ecological-area designation limits or prohibits development in the area, Collins said. The stickleback is a subterranean fish not found swimming freely in the river's nominal water flow, but should the river back up, the fish would surface, he said. It is on the federal endangered species list. The bigger issue is traffic, Collins said. An extension of Copper Hill Drive is needed to provide access into the ranch and adjoining properties, he said. One of those properties belongs to Newhall Land and Farming Co. that has its own plans for extending the road, Collins said. Talks are under way with Newhall to explore joint road improvements throughout the nearby area, he said. Don Culbertson, a county regional planning supervisor, said the partnership has notified the county of its intent to try to develop the site. Collins said urban sprawl has brought an end to farming on the property, west of San Francisquito Canyon Road and north of Copper Hill Drive. "During the '70s and '80s, much of the ranch was leased for private farming use," Collins said. "Boskovitch Farms [sic: Boskovich], the 'Onion King,' leased more of the land around there than any other farmer but pulled out of the valley a year ago because of urbanization." Now the sons and daughter of the late Francis Clougherty, co-founder of the Clougherty Packing Co. that holds the trade name Farmer John, want to develop the land, keeping a portion of it as a family get-away and designating a portion as open space, Collins said. Clougherty and his brother, Bernard, bought the ranch in the 1940s from Hollywood B-movie actor Harry Carey [sic*], Collins said. Several adjoining parcels were purchased until the ranch totaled 1,700 acres, Collins said. 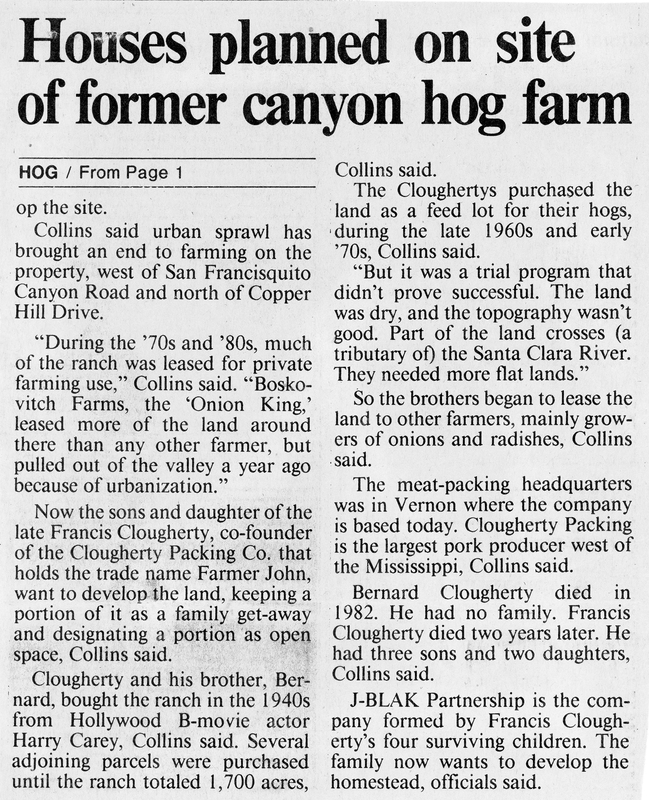 The Cloughertys purchased the land as a feed lot for their hogs, during the late 1960s and early '70s, Collins said. "But it was a trial program that didn't prove successful. The land was dry, and the topography wasn't good. Part of the land crosses (a tributary of) the Santa Clara River. They needed more flat lands." So the brothers began to lease the land to other farmers, mainly growers of onions and radishes, Collins said. The meat-packing headquarters was in Vernon where the company is based today. Clougherty Packing is the largest pork producer west of the Mississippi, Collins said. Bernard Clougherty died in 1982. He had no family. Francis Clougherty died two years later. He had three sons and two daughters, Collins said. J-BLAK Partnership is the company formed by Francis Clougherty's four surviving children. The family now wants to develop the homestead, officials said. * Webmaster's note: Harry Carey was not a "B-movie actor." He was a major box-office attraction and an early John Ford star. He did not appear in "B" (budget) Westerns.